Figure 1. The American beaver. When Doug, the Land Trust’s Big River Program Manager, first proposed the idea to me, I was more than a little surprised. We had spent so many weeks talking about large woody debris, culvert passage, and road decommissioning that it seemed almost impossible for something so cute and furry to help salmon. I suspended my disbelief and delved into research. 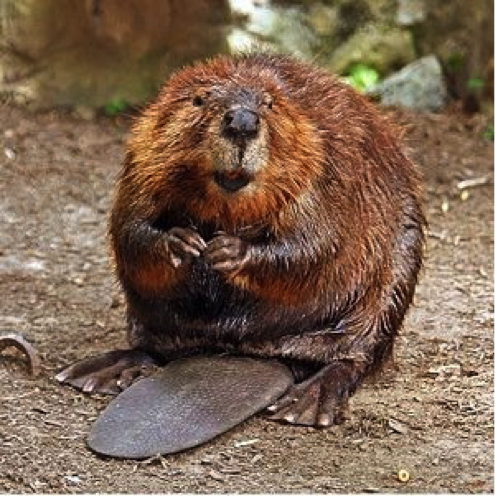 Lo and behold, beaver reintroduction projects have proven successful throughout the Pacific Northwest, improving salmon habitat and raising fish numbers. It isn’t an easy choice by any means; reintroducing beavers on one property requires monitoring their survival, distribution shifts, and population growth. However, a surprisingly large body of literature exists on the remediation of these issues, and has been used in other beaver reintroduction projects. So, why not try it? Figure 1. In-stream measurements at Russell Brook. Although picturesque, the stream is not very hospitable for rearing and migrating salmon. The large woody debris project forges ahead here at the Mendocino Land Trust. Two weeks ago, I went into the stream at Russell Brook along with Doug (Big River Program manager) and Nicolet (Trails & Stewardship Coordinator). We walked the length of the project area (about a half mile) and took some basic stream measurements (Figure 1) that quantitatively describe the area and determine the baseline level of viable salmon habitat. Spoiler alert: it’s pretty low. Pools are infrequent and shallow, meaning that salmon don’t have good rearing habitat, and cannot rest during upstream migration. Water temperature is high, which poses a problem for these cold-water inhabitants. However, only a couple hundred feet up the stream, where large woody debris has already been installed, deep pools swell over the tops of waders (a bittersweet discovery). 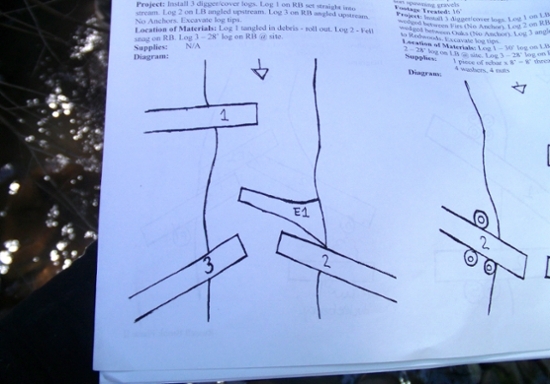 The California Conservation Corps (CCC) has now begun the arduous process of hauling and anchoring huge logs in the stream according to detailed plans (Figure 2). I’ll get to see the crews in action in a couple weeks while conducting an inventory of the large woody debris that is in place. Figure 2: Large woody debris plans developed by the California Conservation Corps. Some weeks ago, we had our idea for a linkbait: drink recipes inspired by file format extensions (JPG, TXT, etc. )—it was nerdy and reflected the interests of Commerce Kitchen. We initially wanted to make it an infographic, but after a number of discussions on how best to promote the idea, it evolved from a simple online posting into something much bigger: a multi-week drink-making competition between local start-ups. As the Freedom Award Luncheon looms closer, I am working harder than ever. I keep track of all our table sales and preparations. I've made so many spreadsheets, I almost never want to open Microsoft Excel again! I am learning about all of the organization it takes to prepare for this event, which will host somewhere around 470 people. All of the decorations and the menu must be ordered. Invitations need to be sent out. I'm sure that when I get back from vacation I will have a stack of RSVPs to wade through so that we can begin table seating arrangements. Fluorescence image of Drosophila wing disc in cross-section. Cell nuclei in blue, membranes in red, and a protein complex unique to Wnt signaling in green. After several weeks in a fruit fly lab, I now feel quite confident in my ability to dissect larvae, create new crosses from different fly strains, and prepare tissues for microscopic imaging. Although I had never performed these techniques just two months ago, I now carry them out from memory on a regular basis. Without realizing it, I have learned how to identify many of the common Drosophila mutants that are used to create experimental crosses. I am also learning how to combine various protein or RNAi constructs in a single Drosophila line in order to interrupt or better visualize components of the Wnt signaling pathway. However, the most amazing thing to me is how much my dissection skills have improved. On my first day, I was shocked that I would be expected to remove organs from a larva only two or three millimeters long. Now, I can perform the task readily, although not nearly as quickly as my more experienced co-worker, Misha. I still have a lot to learn about the mechanisms involved in Wnt signaling. Understanding the research is far more difficult than simply carrying out the procedures. While I now know quite a bit about working with fruit flies, the complexities of the signaling pathway still elude. I am currently an intern at Commerce Kitchen, a web development and marketing company in Denver. My fellow intern (and fellow Reedie) Rebecca and I get to work there, and explore the city in our free time, for nine weeks this summer. The experience marks many firsts for me. First time visiting Denver. First summer living away from home. First paid internship. First experience working in marketing. And here, my first blog entry; it only makes sense to talk about my first impressions. My internship at De Paul Treatment Centers is a non-profit development (fundraising) internship made possible by Reed's Internship Advantage Initiative. My first week at De Paul Treatment Centers was mostly filled with getting familiar with the office and who works there, and what their philosophy is. The orientation I attended really brought home their message of treatment for everyone. Although anyone can receive treatment at De Paul, their biggest mission is providing treatment to those who cannot afford it and who would otherwise go without treatment. I am currently working at OHSU in the lab of Marcel Wehrli, Ph.D. The lab studies development in Drosophila (fruit flies) and focuses on the Wnt signaling pathway, one that features prominently in developmental biology research. My first week at OHSU has introduced me to a completely new area of biology. Most of my prior research experience has been in plant physiology. I have never worked with Drosophila before and know almost nothing about their development, so I am guaranteed to learn something new every day. As a novice in the field, I learn from both Marcel and his research assistant, Misha (also a Reedie). I don’t yet have a project of my own, so I usually assist Misha with her experiments. Some of what I learn is completely new – techniques that I have never seen before. In the past week, I have learned how to distinguish between male and female flies, how to tell a virgin from a fly that has never mated, how to dissect a fly larva, and how to identify the imaginal discs within the larva that eventually develop into various appendages. Other things are familiar but must be re-learned, as different labs carry out basic protocols in different ways. Antibody staining fruit fly larvae is very different from staining plant tissues!